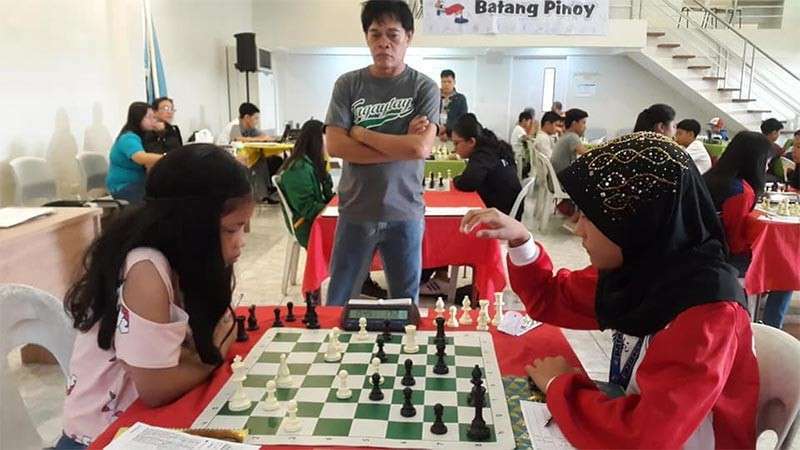 TAGUM CITY -- Cagayan de Oro’s quest to win more golds in 2019 Batang Pinoy Mindanao chess competition keeps burning on Thursday, February 7 after five rounds in standard event skirmishes over at the Provincial Capitol’s Bulwagang Pangkarungan building here. Rapid event gold-taker Ruelle “Tawing” Canino of Kauswagan Elementary School is in hot pursuit of a second gold after taking the solo lead in 12-under girls category with a perfect 5 of 5 performance going to the last two rounds of the most arduous yet entertaining standard event with one hour and 30 minutes time control. Lorebina Carrasco II of Corpus Christi High School (13-15 girls) and Clyde Harris Saraus of Jasaan (13-15 boys) also won their respective matches in Round 5, thus leaving Santiago Lumancas IV as the only casualty in the race for gold after absorbing his second defeat in the 12-under boys level. Up by a full-point, little Tawing picked her fifth-straight win at the expense of Rhynna Mamontuan of Maty City. Both wounded with one defeat each, Palaro veterans Carrasco and Saraus bounced back in impressive manner, winning swashbuckling-style against Joannah Love Marie Olay, the daughter of International Master Reggie Olay, and another Kidapawan City bet Nick Danuel Pabroquez, respectively. The black-wielding Carrasco demolished Olay’s kingside fortress via a Rook-aided pawns-storming to force the latter’s resignation after 30 moves of an irregular King Pawn’s opening. It was a precious chance for Carrasco to recover as Olay was the sole leader before their Thursday morning encounter on board one. If Carrasco and Olay will be able to sweep their remaining two matches, the former will prevail for gold in the event of a “win over the other” tiebreaker. “We can’t ask for more kadto ra gyod nga round akong gi-ampo nga iyang ma-hurdle kay lisod na maapsan kon nidaug si Olay,” said Lorie’s doting father, Emmanuel Carrasco. A four-gold finish is achievable for the Oro chess contingent especially that there is still one more event left to be disputed on Saturday—the blitz competition—wherein a reinforcement from Corpus Christi School in the late-arriving blitz specialist Euniel Grant Capilitan is deemed to be an added firepower. “Proud kayo kita kon maka-gold ang mga bata sa standard event kay kini man pinaka-prestige nga category sa chess time control-wise,” said Oro chess head coach Johnnel Balquin.